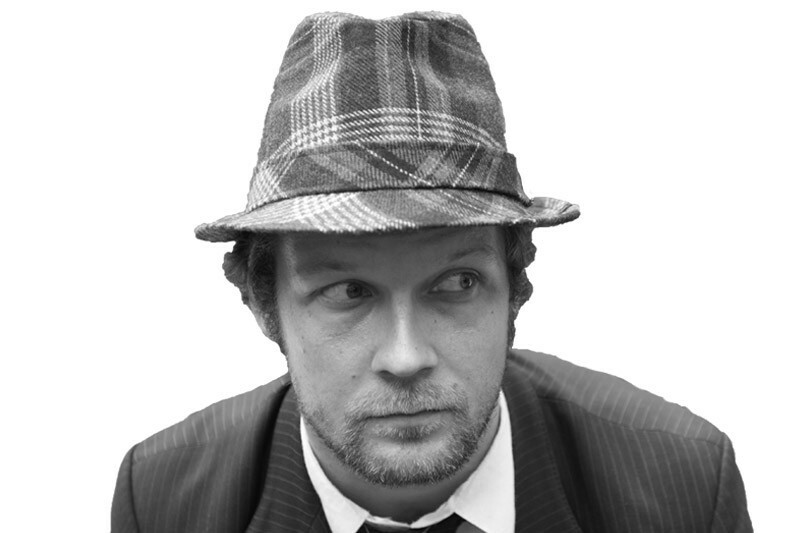 Jani Leinonen (b.1978) plays with the systems of commodity exchange and celebrity, and the marketing strategies through which they operate. 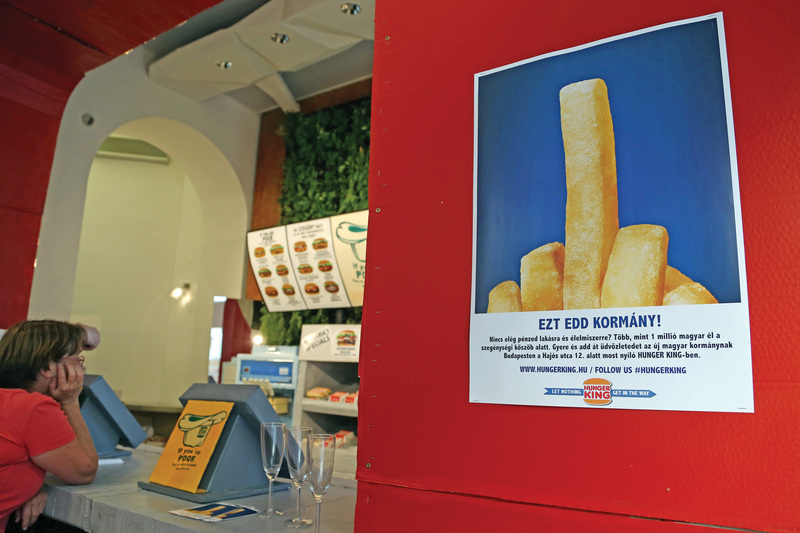 Leinonen attacks symbols and marketing strategies, turning them into objects of ridicule, creating clichés about our agreed marketing society and economical everyday. With these strikes, Leinonen unfolds the chain reaction we all are voluntarily involved in and plays up the iconographies of the global brand land. Leinonen’s installations are shops, bars, slot machines but also plain painting exhibitions. What is displayed, though, are not goods but an artistic allegorization that appropriates these marketing strategies only in order to unhinge their underlying assumptions about value and appropriateness. Leinonen graduated from Academy of Fine Arts in Helsinki in 2002. His works have been exhibited widely internationally, i.e. at the Nordic Pavilion at the 53rd Venice Biennial, Galerie Gmurzynska, Wilhelm Hack Museum Ludwigshafen and Frankfurter Kunstverein. In Jani Leinonen’s Food Liberation Army, four men disguised as repairmen removed a Ronald McDonald statue from a Helsinki restaurant. 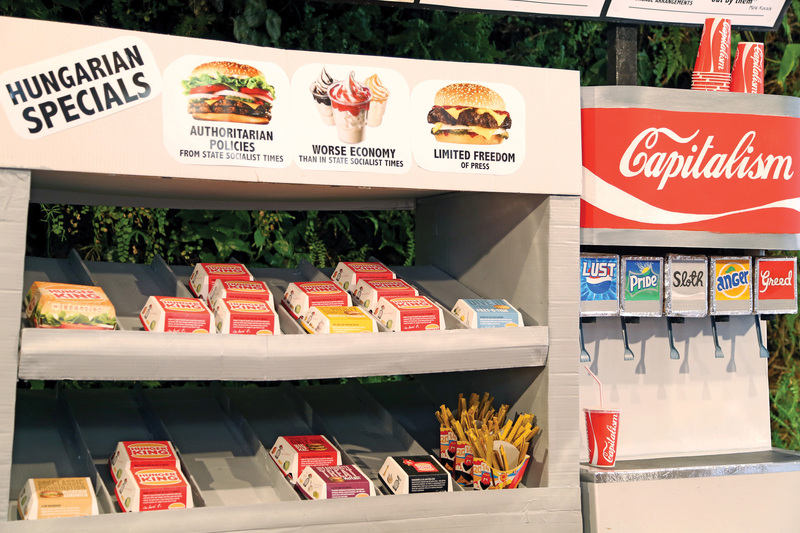 Later on, McDonald’s received a ransom demand, broadcast on YouTube, asking them to answer several questions about the sourcing of their food and their ethical stance. McDonald’s refusal to negotiate with terrorists (McDonald’s spokesperson) resulted in Ronald’s execution by guillotine. The video has received more than a million hits on YouTube and made international news, with the story being covered on Fox News, Bill O´Reilly, CBS, France24, Channel 4 and the Washington Post, among many others. 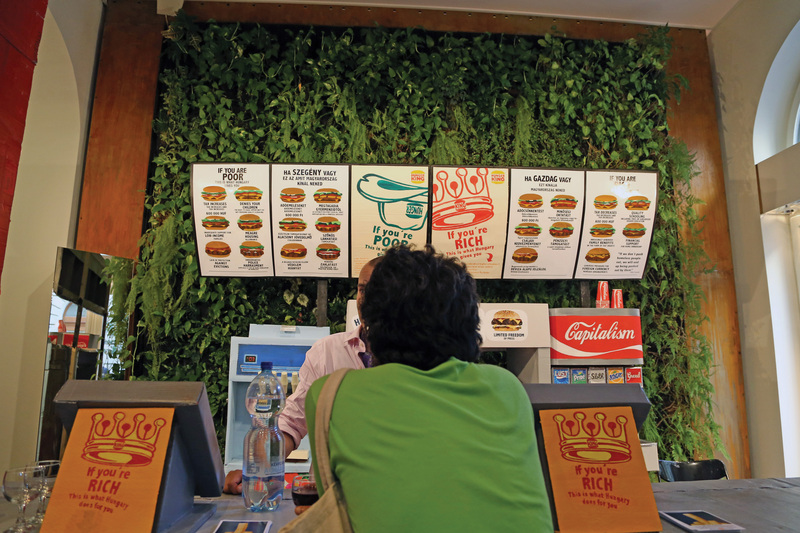 Located behind a resplendent Opera House in Budapest on the same road as Louis Vuitton, sits Hunger King, a place that seems to be just like any other burger joint, however, it is anything but. 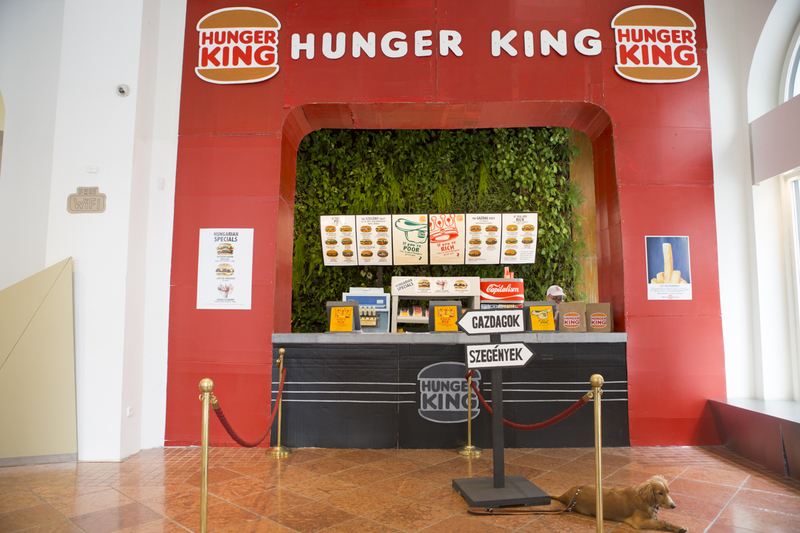 Hunger King is a regular fast food outlet that is pushed onto the masses; Hunger King is a critical sociopolitical art installation serving to highlight Hungary’s significant crises of social inequality and homelessness. 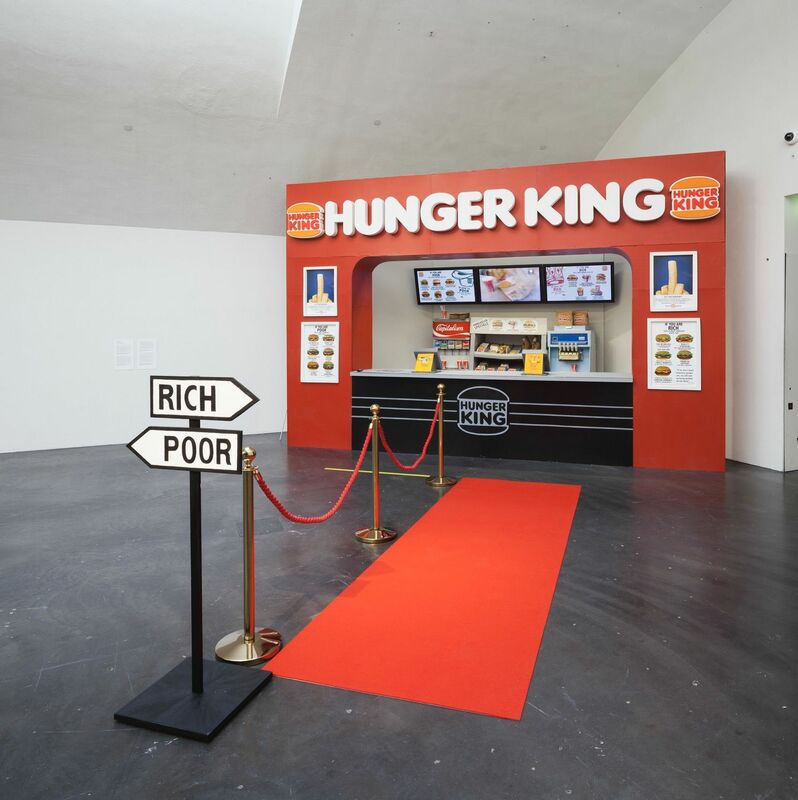 The sign at Hunger King directs customers who identify as “rich” onto a red carpet, which leads them to the entrance, while the succession of “poor”, many of which are homeless takes them around the side of the building. 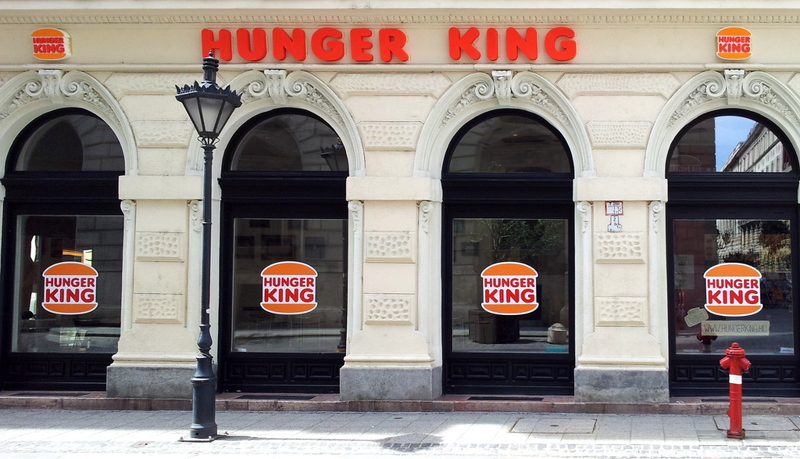 The sign that features a crown and burger logo is given a representational twist as it is given a new name, as it references the 3.7 million Hungarians living below the breadline. 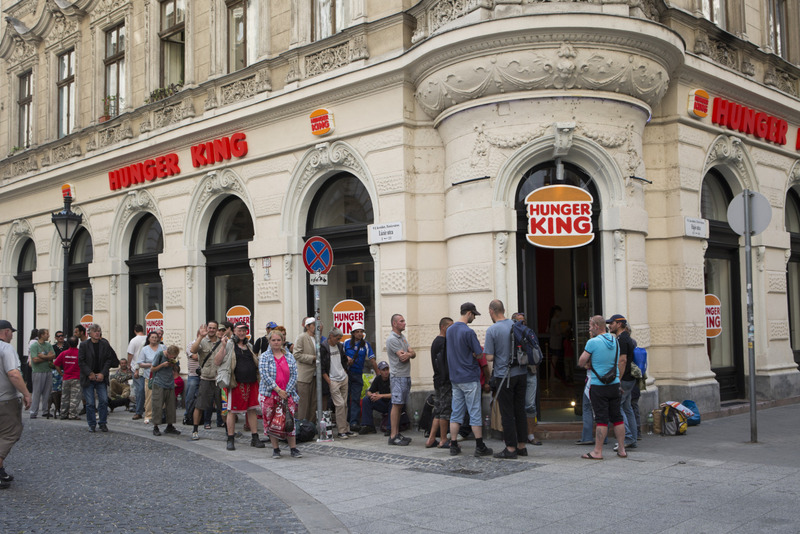 During the three-week-long installation individuals who are in financial need have the ability to wait in the succession around the building for six hours and in turn, will receive 3,400 forints (around £9 or $13.60 US) in a burger box for their trouble. This would be the same amount of money they would have made by working a minimum wage job in Hungary. All while, those who self-identify as rich can skip the line, walk up the red carpet and get burgers for 600,000 forints (£1,560 or $2357.39 US). This three-week installation served as a critical response to a law that allows Hungarian councils to ban homeless people from sleeping in public areas, basically dispossessing the dispossessed. Those who are homeless and have little or nothing can be fined or even sent to jail for being out on the streets. Jani Leinonen’s work protests the “criminalization of homelessness” and somehow making the lives of those who have little stability even more precarious. All photos courtesy of Jani Leinonen/janileinonen.com unless otherwise noted. The Homelessness Fair, curated by Finish artists Jani Leinonen and Riiko Sakkinen, introduced a whole new exhibition concept to the Finnish art scene. 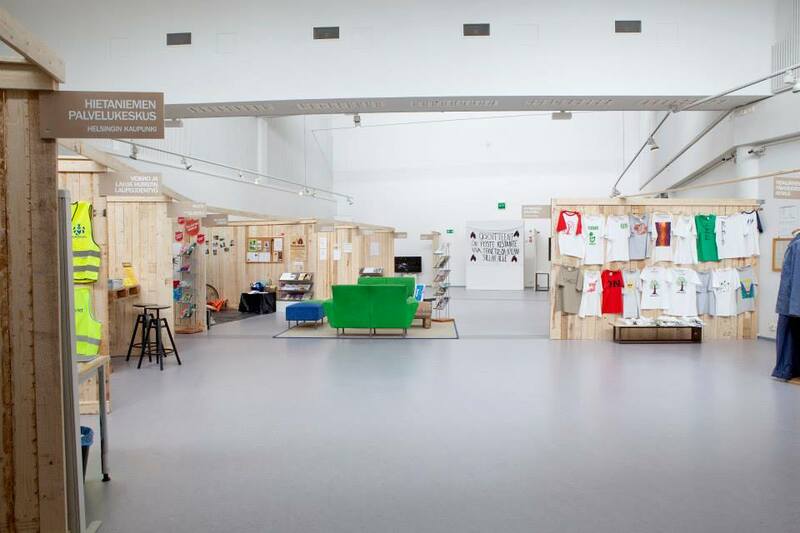 Exhibited at Hyvinkää Art Museum, Leinonen and Sakkinen have invited different civic organisations that deal with homelessness, social institutions and other active parties in the field to take part in the exhibition. The context is art, which at its best is a meeting place of different approaches and viewpoints. 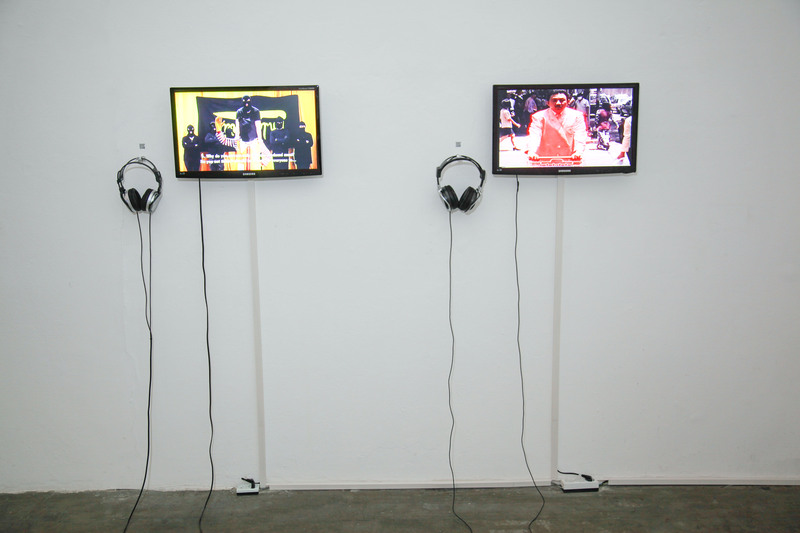 The exhibition project has documentaries about homelessness, a social comic workshop for the homeless which is instructed by artist Katja Tukiainen, and there is also the Finnish Football Championship of the Homeless on 15 June 2013.